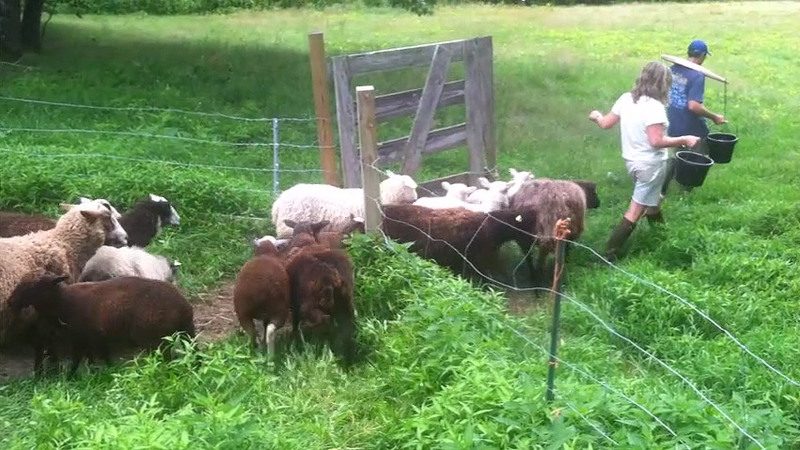 Mary Fallon, from Durham, Maine, is a mother of three children, two dogs, 25 chickens and a flock of 22 sheep. 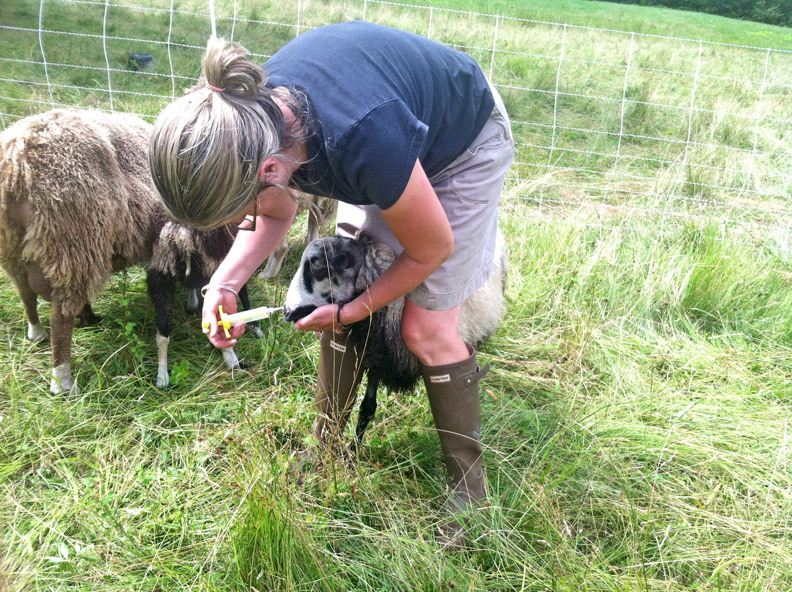 While her husband Dan works as an electrical engineer, her main job -- aside from looking after the kids -- is feeding, breeding, and caring for the sheep. Sometimes she sells them to other farmers or sells the meat, fleeces and wool to neighbors or at local markets. The sheep came into Fallon’s life when she married Dan – and now they are her passion. But in the seven years she has been tending sheep full-time she hasn’t turned a profit. Instead, the family relies on her husband’s income. 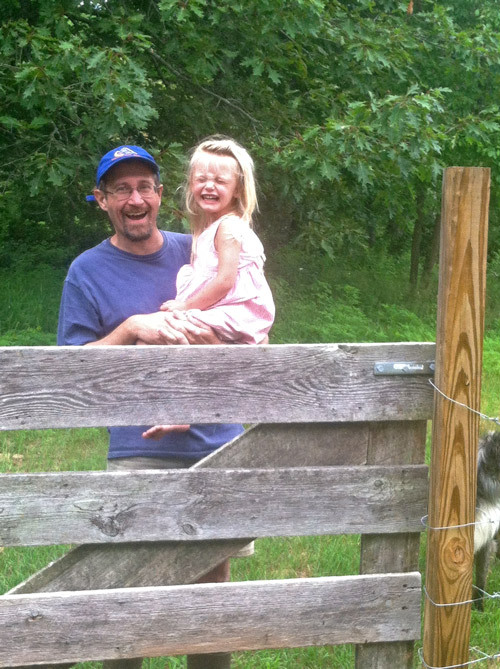 To save money, they live off the land -- eating vegetables from their garden and, of course, lamb meat. Wake up to a child kissing me and telling me he loves me. He asks if he can go downstairs, and after I grant permission he toddles off and I lay there sleepy with his younger sister still nestled by my side. Breakfast. Today we have blueberry pie, bagels, and yogurt with fresh peaches. My husband Dan grabs a cup of coffee and we talk about the logistics of everything we have to get done. I brew a cup of tea and look at the day’s schedule. We have a lot of work to do and will be cutting it close in a few places. My oldest, Galina, goes to feed the chickens, taking her little brother Teague along. Sundays we attend church in the morning. Lately, we have tried to do this as a family but have to divide up some days to get it all done. This morning, my husband Dan leaves for mass alone. When you raise animals you are always skirting that balance between getting it all done and participating in the life of your extended family, your friends and your community. Can’t do it all. Today we are going to try. While Dan is gone, I decide to make popovers to use up some of the raw milk in the fridge that’s on the brink of turning sour and the many eggs laid by our chickens. I try to bake at least three times a week. Preparing the popovers and skeining yarn, which means twisting it into a coil so that it can be used for knitting. We shear our sheep in the spring and fall. 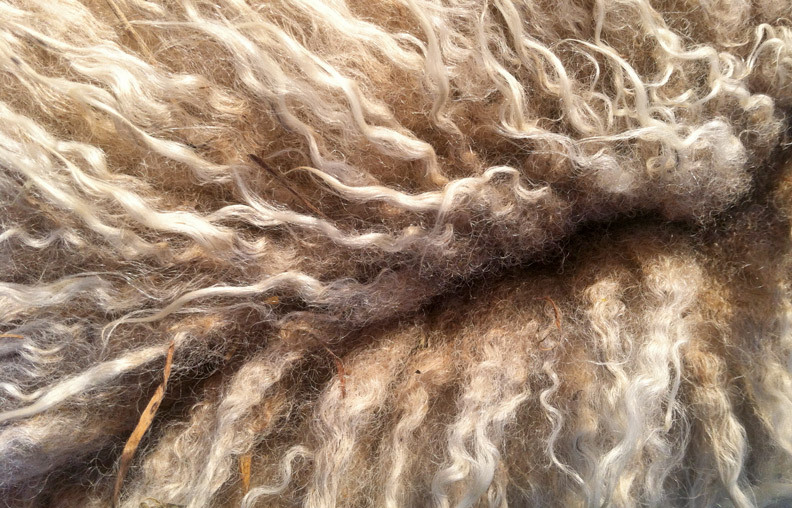 We take our raw wool to a small fiber processing mill in Monmouth. When we get our yarn back it is undyed and on cones. From the cones it needs to be skeined so it can be rinsed. We hang our skeined and washed yarn on a rod that we set onto nails in the trim of the porch so that the fresh air and sunlight will thoroughly dry it. The drying takes a couple days. Teague’s first time out. 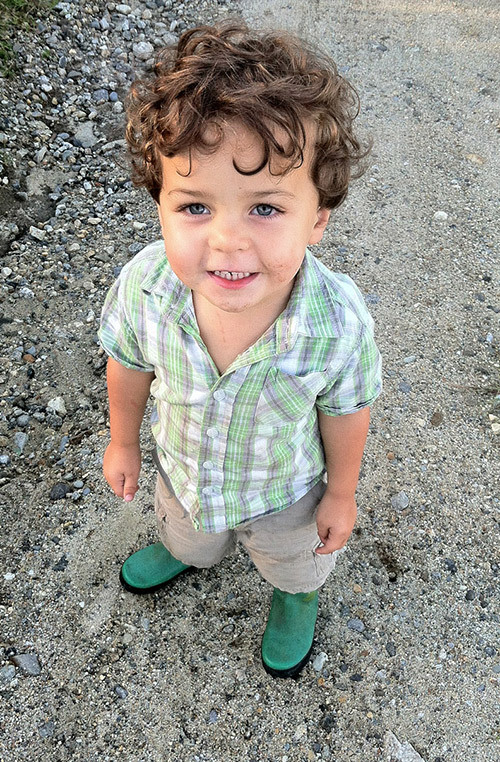 Our son Teague is four. When he fusses or refuses to do what we ask him to do, he gets a time out or runs laps around the garage. 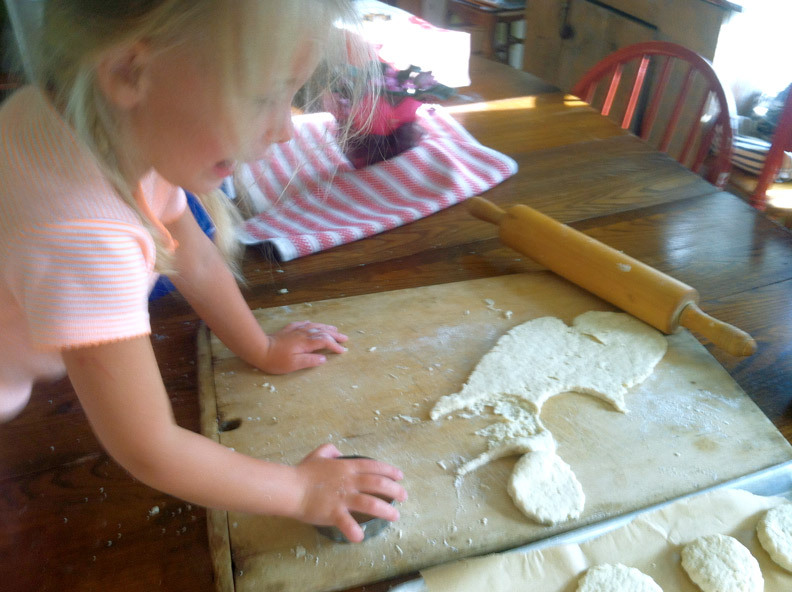 Running a farm and a household with two toddlers and a soon-to-be 12 year old has really taught me the value of patience, as I often am in great need of it! Having them jump into what I am doing or redirect them toward a chore usually works. While they love anything going on in the kitchen, helping with the animals and digging around in the garden, they sometimes need to be put into a pouch and strapped onto someone’s back. Feed the sheep. We purchased two new sheep for the flock just after the fourth of July. We quarantined them until we were certain they were healthy and ready to be added. Today, we will pull out four lambs to be weaned and readied for their new home and Mike Abbott, another sheep tender who we team up with, will come by with a ram that we will trade out for one of the sires from our spring lambs. We sold our other breeding ram a week ago to an Amish farmer in Houlton. 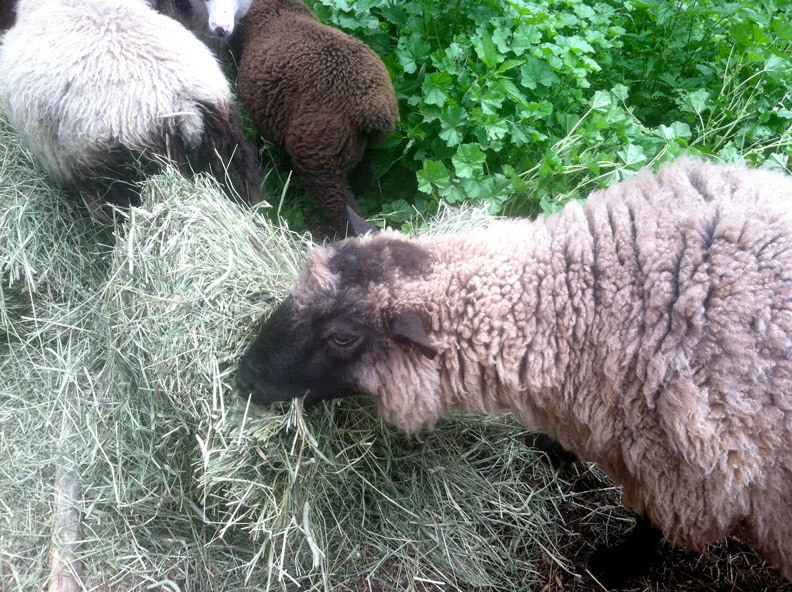 As I feed the barn lambs, I begin preparing for their addition to the flock. I move them out of their pen and into the paddock. They will eat the fresh grass there, as well as the hay and grain I have for them. Dan is home and ready to help move the sheep to the barn. That goes pretty easily as they have chewed through most of the good grass and are ready for a change. Since we are moving sheep around, we decide to bring them to the barn to make the job easier. I pull the lambs out of the flock that will be sold next week. They will be weaned and readied for that transition by being penned together away from their mothers. Most of them go easy but one ewe lamb kicks, making it difficult to get her into the pen. I pick and carry the remaining lamb all the way in to the barn to eliminate that problem. On pasture, they get less human contact and can get shy of humans. In the pen, we will spend lots of time with them to be sure they are calm and ready for their new home. Wash feeding bowls. Every other day or so we bring the feeding bowls in from the field and clean them. Sheep often step into their bowls and have very poopy hooves. We scrub the bowls with a dilution that contains bleach to kill any bacteria and parasites on the bowls. They dry in the sun. Move Baby James, the ram that will be traded today, to the pen. Dan gets the shepherd’s crook [a tool used to catch sheep] but I walk over and Baby James lets me guide him right into the pen. They know and trust me so I can move around in the pen with very little notice. Once he is secure, we let the two new lambs join the flock. 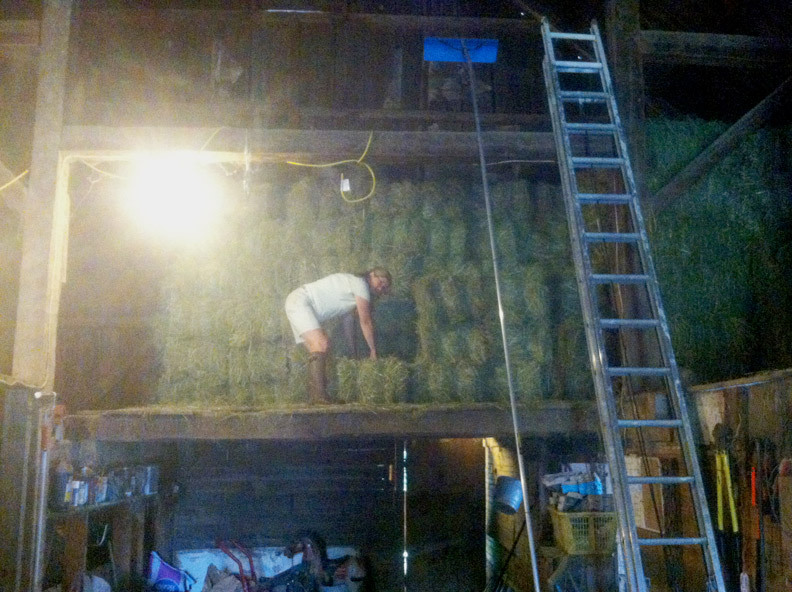 Baby James jumps the gate so we open up the back of the barn and let him have the whole area to himself. Shower. I am either too busy or too tired to shower daily. When I get to shower, it is one of my favorite joys. Deprivation really does pique appreciation! Snack. 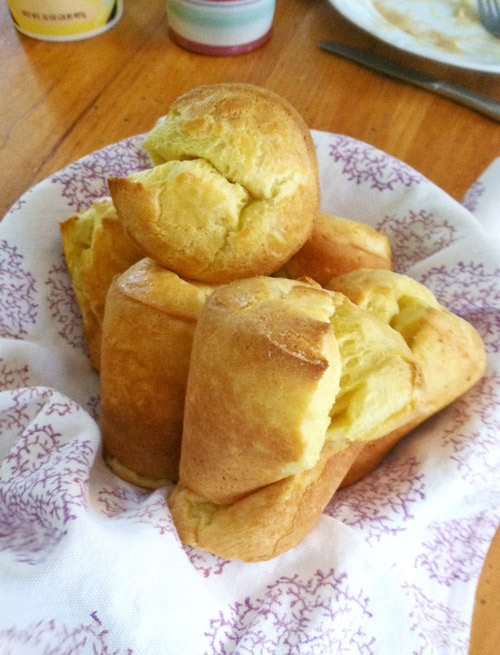 Popovers are best when hot so everyone has one while they are still fresh. I am still chewing mine when we pull out of the driveway. Dan is preparing new fence posts. He pulls the little kids into that job and Galina and I head off for Portland to attend a special mass where a friend’s husband and son will enter the church in a Confirmation Ceremony with the Bishop. Going to Portland is a big deal for us. It is a 25-30 minute drive. We arrive a few minutes late. We enter the church and find seats near the choir. Today, this will be a High Latin mass led by a cantor and choir. Back in the car and headed home. Mike Abbott calls from my house. He has our new ram and no one is there. I tell him we are on the way. I am stressed. I had a feeling the schedule we set was ambitious but where to cut? We arrive at home. Mike and I settle on a plan. Moving rams is a serious business and we don’t want any of them to get hurt so we ask the older kids to watch the younger ones while we move Mike’s trailer to the paddock. We have Gus, our new ram, unloaded and in the paddock. Mike pulls to the front of the barn so Dan and I can guide Baby James from the pen to his trailer. He’s been a great ram, gentle and healthy, siring close to 40 lambs for us over the past 3 years. He was born on our farm. Mike and I go the paddock to screen the young lambs for parasites. While all animals carry some parasites, you want to be sure that the parasite load is not getting so big as to cause anemia. First I check under the eyelids to check the redness. The redness would be an indicator of blood loss. Lethargy indicates, too, that something is off. We check the lambs and feel confident that they are looking healthy and need only to give one lamb a dose of drench -- or medicine. We move the sheep to the new pasture. Dan gets them water. 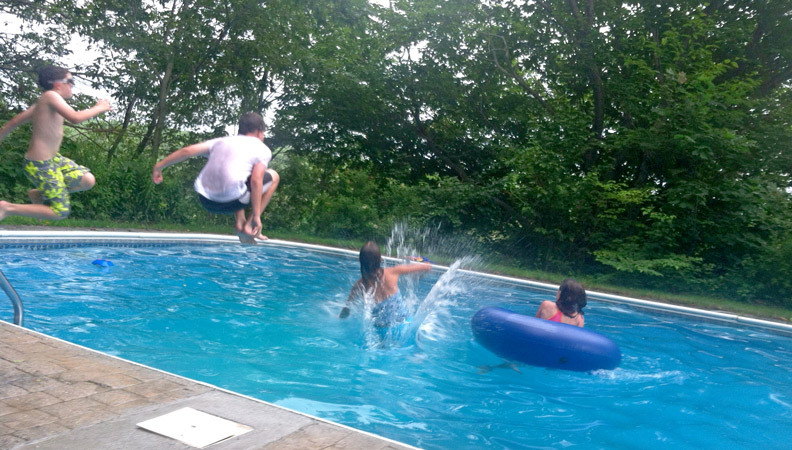 Then we pack up the kiddos and head over to Kathy and Mike Abbotts’ place for a swim and a beer. We head home. On the way, we drop off a book order to our neighbors, the Hansons. Everyone piles out of the car and we visit with them for a bit. 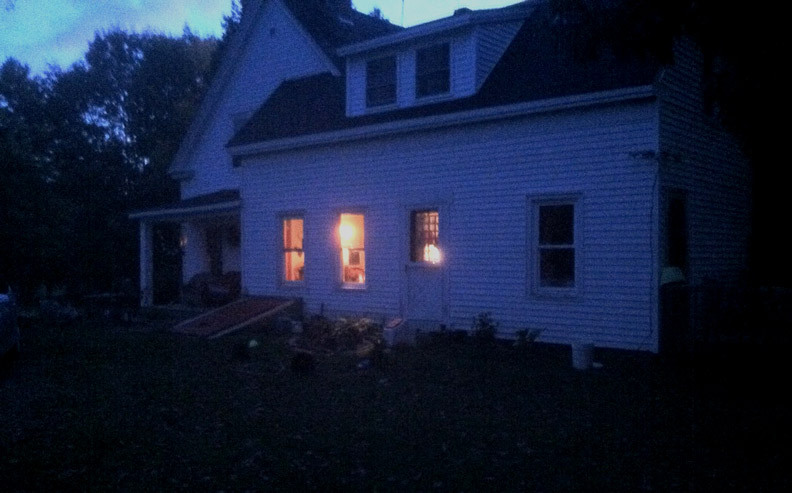 Living in the country you get used to the drop by phenomena, where no one calls ahead, you just drop by. We have the little kids in pajamas and ready for bed. No story tonight. They are tired. Dan brings Teaggie to his room and I settle Sofie. As I rub her little back and she murmurs her sweet nothings to me, I say my prayers. All at once I am grateful. Grateful for my husband, my kids, my friends, my town and my flock. The overcast sky has given way to a beautiful sunset. The golden hues of the sun shine against the barn and turn it golden too. I can see it and hear the whir from the fans pulling the cooler air into my room. My little baby girl, whose not such a baby anymore, is asleep. Her sweet face so innocent is just beautiful. Dan is already downstairs when I come down. He’s cut some bread and cheese. It looks good. So does the glass of wine he is sipping. I pour myself just enough to go with the hunk of bread I cut and fill it with cheese. I settle onto the couch with my snack. Dan pulls down the book we’ve been reading and picks up the story where we left off. I finish my snack and wine and take up my knitting. Galina with her needle felting sets up on the rug. Dan’s deep voice glides through the story. We get to the end of the chapter and decide to call it a night. Just before I go up to bed, I check the weather. They are calling for hazy, hot and humid weather. Tomorrow, we plan to get up early, do our chores and head to the beach. It is summer after all! Readers: What's it like to spend 24 hours in your shoes? Email blake.ellis@cnn.com for the chance to be profiled in an upcoming story.